Mons Regius - Saur, A. Size : 2.7 x 3.7 inches. / 6.8 x 9.3 cm. 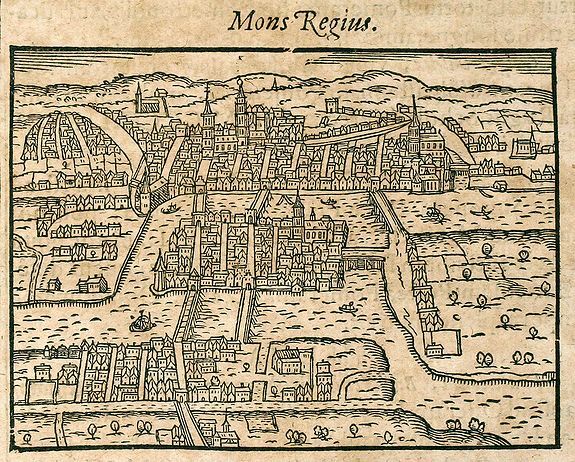 Description :Nice woodcut view of Koenigsberg (today: Kaliningrad) in Eastern Prussia on a full text sheet. From "Parvum Theatrum Urbium sive Urbium Praecipuarum totius orbis Brevis & Methodica Descriptio" by Adrianus Romanus printed 1608 in Frankfurt. First printed 1595 with the same woodcuts by Abraham Saur published by N. Basse.